32 PLAYER TOURNAMENT - Mark your calendars! 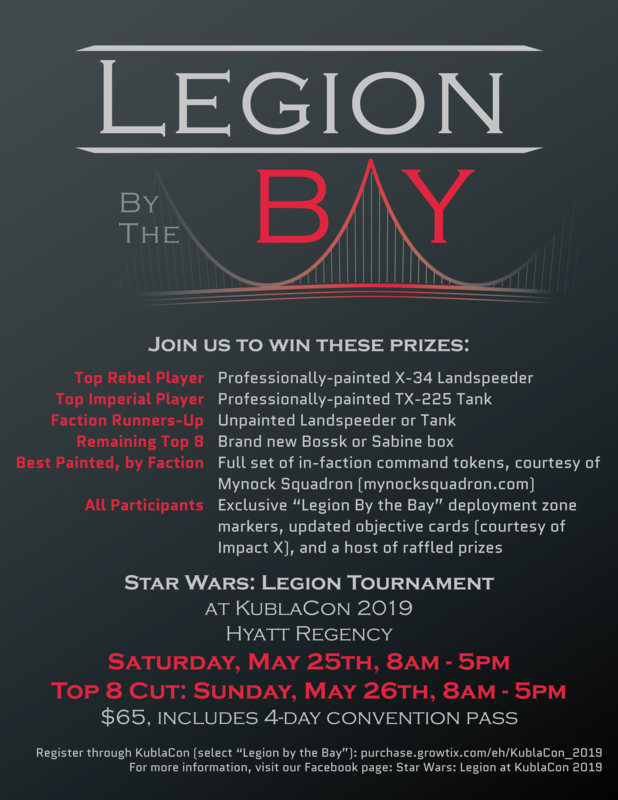 We are creating the biggest and greatest California Star Wars Legion tournament. Come! Play! Compete! Join our family. Please reach out to any of the organizers or myself to help with information and accommodations. We are here to help grow our Legion Gaming Family! - Kris Swett - krisswett@gmail.com or David Zelenka, Darryl McMillon, Brett Parsons, Mark Goddard, Nema Ashjaee and Kristin Lundin. Cost: $65. Includes 4-day convention badge, Legion tournament access, and all associated fees. Rules: Standard Tournament Rules from FFG. How to Sign-Up and Pay: Follow the link below. Click on the “Tournaments” filter and register for Legion By the Bay. This ensures that you lock-in your slot for the tournament and get access to the convention. Sponsors: Notorious Scoundrels Podcast. Fifth Trooper Podcast. Sword and Board of Ukiah, Every Little War - and more to be announced. Thanks for sharing! Any thoughts on slightly longer rounds? 2 hours seems a little tight for 6 turns. Hey, sorry for the late reply! Yeah, we agree 2 hours is short. We're working with the venue to extend it as much as we can. It sounds like the rounds were extended a bit. All glory to the con! Indeed they were! And we have new prizes on offer. You can stay up to date on our Facebook page. Let us know if there are any questions! Tickets for KublaCon have gone up to $80 as of today. But we've got your back! We worked with them to get a special extension for Legion by the Bay. Get your tickets by April 14th to secure the $65 price. Hurry, because we're down to last 10 or so spots. Check out the image a few posts above for all the prizes we're handing out. And we're not even done working on getting more swag for you guys! Today is the last day before ticket prices go up! We only have a few spots left. We've also added a 2v2 team tournament on Day 2. So anyone who doesn't make the top cut can continue playing in a fun and casual format.